Weight Loss Secret: 9 High Fiber Foods…that actually taste good! Okay, ready for some really good news? Did you know eating is one of the best ways to lose weight. Yes, you read that sentence correctly…it says eating. The secret is to fill up on fiber rich foods. High fiber foods leave you feeling more satisfied and fuller longer which means you end up eating fewer total calories. In fact one study from the US Department of Agriculture found when women double their fiber intake to 24 grams per day they eat about 90 fewer calories per day. That translates to about 9 pounds in a year! Bottom line, eat more fiber and soon you’ll be very excited about your bottom line:) (FYI the recommended amount of fiber is 14 grams per 1,000 calories. So that’s 28 grams of fiber per day for a 2,000 calorie diet). Eating enough of the stuff is also a sure fire way improve your health since fiber lowers cholesterol, acts like a sponge in your stomach absorbing carbohydrate, fat and protein molecules and it decreases your risk of diabetes and colon cancer. Whenever I make a meal or grab a snack I try to be conscious that what I’m choosing has a good amount of fiber in it…but let’s be honest whatever I grab also has to taste good. Full disclosure, I’m pretty much always tempted to reach for a cookie so I need to make sure my fiber friendly food is easy to make and tasty enough to make me choose it. That’s why I love these nine foods. They are so simple to make for breakfast or grab on the way out the door or pack for a healthy midday snack. Each one is loaded with healthy, figure-friendly fiber and most importantly each one is delicious! Pears: 6 grams of fiber. These babies are one of the highest fiber fruits. Kashi Go Lean Cereal: 10 grams of fiber. Do you ever find that sometimes eating cereal in the morning actually leaves you feeling hungrier? Well not with Kashi! This stuff tastes great and can you really beat getting almost half your daily fiber before noon? Raspberries: 8 grams of fiber for 1 cup. Imagine if you put these on your oatmeal? Oh, it’s like a fiber paradise! Black Beans: 14 grams per serving: Make them into a soup, put them in a wrap or serve them as a side dish..black beans are the superheroes of fibrous legumes. Spelt Bread: 2 grams per slice: I love putting some almond butter on spelt as a quick snack, it’s incredibly filling. It’s also a nice alternative for turkey sandwiches! Guacamole: 11 grams of fiber. Okay, be a little careful here since guacamole also has a lot of fat, good fat, but a lot of fat none the less. Avocados, the main ingredient in guacamole, have tons of fiber which I think makes the happy hour menu a little happier. Oatmeal is one of my go to breakfasts. It’s a healthy choice with fiber and protein that keep me full all morning plus it’s pretty fast and easy to make. 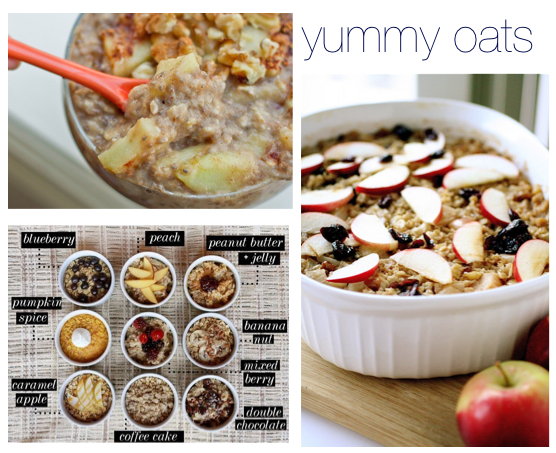 That being said…plain oats can get pretty boring which is why I love some of these recipes I found on Pinterest. These variations include fruit, peanut butter and jelly, spices and plenty of ways jazz up your oatmeal so your breakfast will make you feel good and look good but it will also taste amazing. And definalty give the recipes pictured above from some favorite food bloggers a try if you want to jazz up your morning oatmeal! Homemade Oatmeal 9 Ways from ABeautifulMess.typepad.com. This is the large photo with 9 bowls above and is my favorite because it shows several simple things you can add to make your oatmeal super delicious. Click here to get her amazing recipes that include pumpkin spice, coffee cake and peanut butter and jelly. Plus she has some amazing pictures on her site. Apple Pie Oatmeal from OhSheGlows.com. Click here to go to OhSheGlows.com for the rest of the recipe. Click here to go to TheCuryCarrot.com for the rest of the recipe.